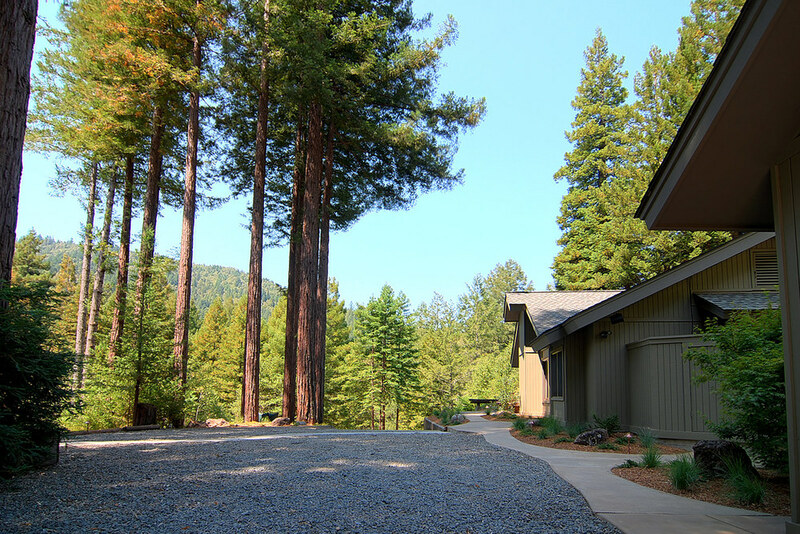 The Elements at Austin Creek is a sophisticated, private compound nestled in the majestic redwoods of Sonoma County, California. Here you will find relaxation away from it all, yet be close to all that makes Sonoma Wine Country such a special place to explore. 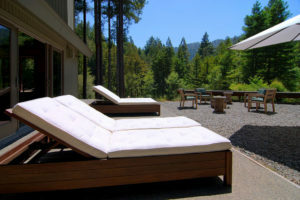 The grounds have been landscaped with indigenous grasses and ferns, highlighting the phenomenal native redwood trees. 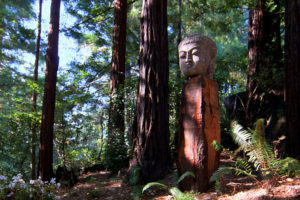 Pathways wind throughout, offering innumerable walks among ever-changing scenery, including a serene pond and an enchanting waterfall to delight and awaken the senses. When you hike from the main compound, pathways become forest trails beckoning further into remote adjoining terrains still on the property. Extended walks offer seasonal streams and waterfalls, in addition to Austin Creek itself, with its numerous swimming holes and opportunities for creek wading. The entire retreat is professionally lit to a stunning degree, complementing its allure day and night. Entertaining large groups is effortless and everyone can have their own privacy, while gathering together in the large entertaining areas. 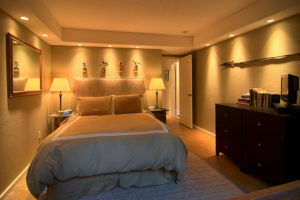 All bedrooms, with a total of three king and one queen bed, are furnished with quality linens and down comforters. 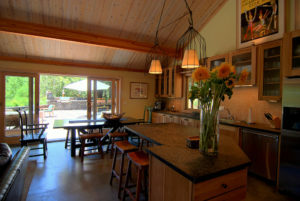 The main house is a contemporary craftsman with a great room, master bedroom and two bathrooms. 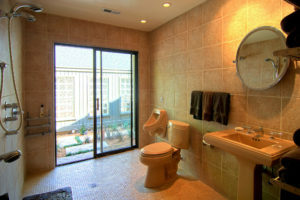 One of which is exceptionally large with multiple shower heads and a Zen inspired private garden. 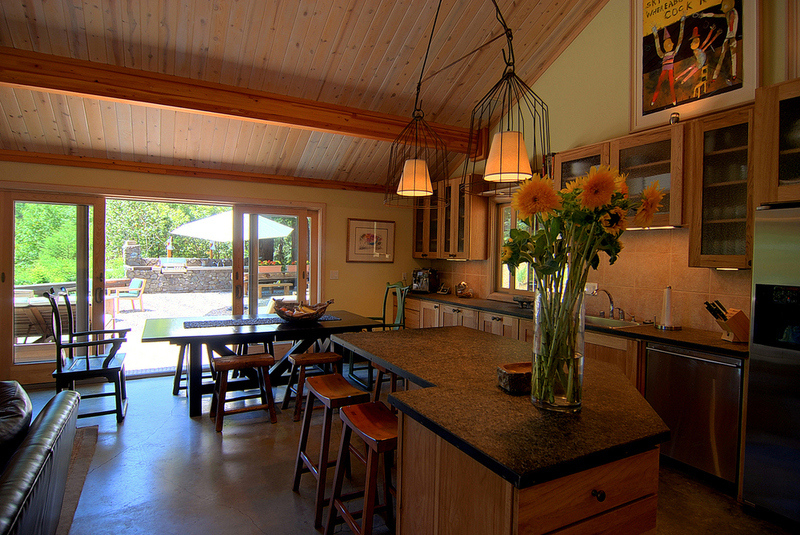 The fully appointed kitchen is centered around a granite island and can accommodate multiple chefs. 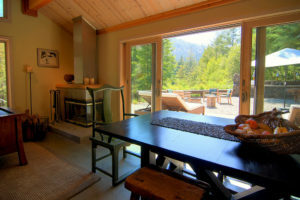 Appliances include a professional six burner Wolf range and oven, microwave drawer, stainless steel refrigerator/freezer, garbage compactor, and dinner service for up to twenty plus people. 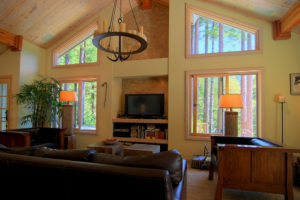 The Great Room has the latest in video, audio and Internet capabilities if that need strikes. 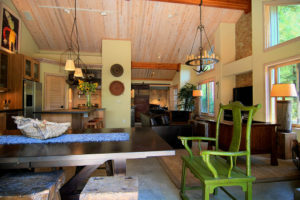 The lodge is replete with fine attention to every detail, from the refectory-style dining table, the deep leather sofa, to custom designed candle chandelier, which radiates throughout the main living area. 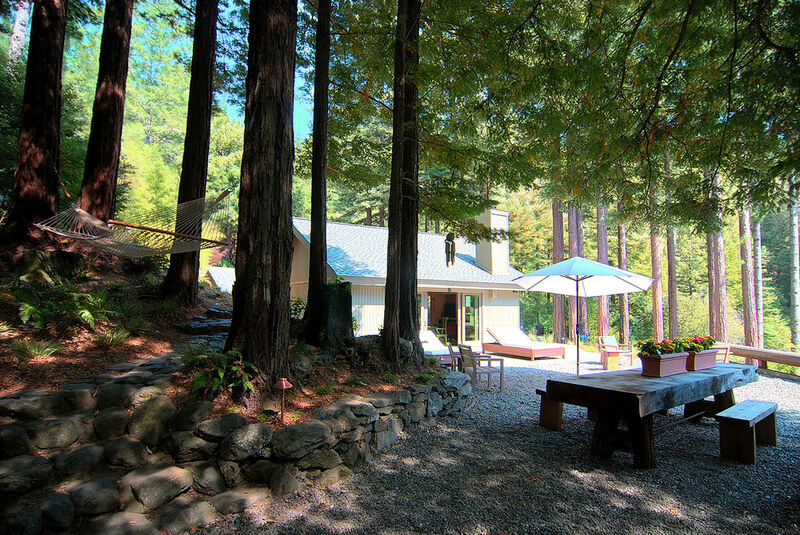 The Terrace off the Lodge is an example of what makes this estate so unique. 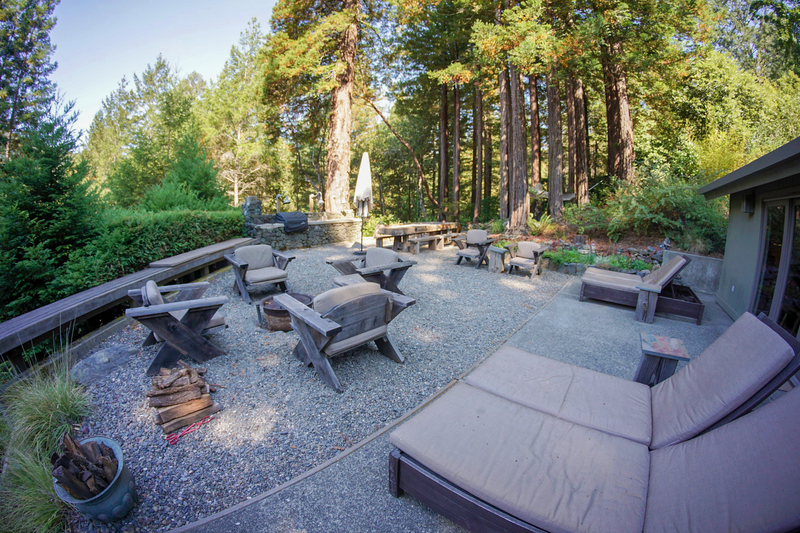 The outdoor kitchen and gardens were crafted from river stone years ago, when the property was a summer campsite. 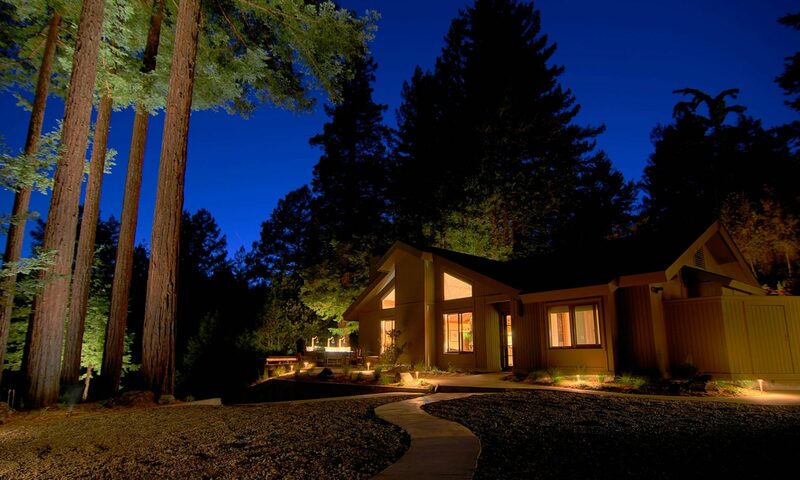 It has been restored and updated and includes a state of the art gas BBQ, sink, lighting, and herb garden. The original river stone fire pit is now the focal point of a modern and sophisticated outside entertainment area, featuring outdoor speakers and LED lighting. 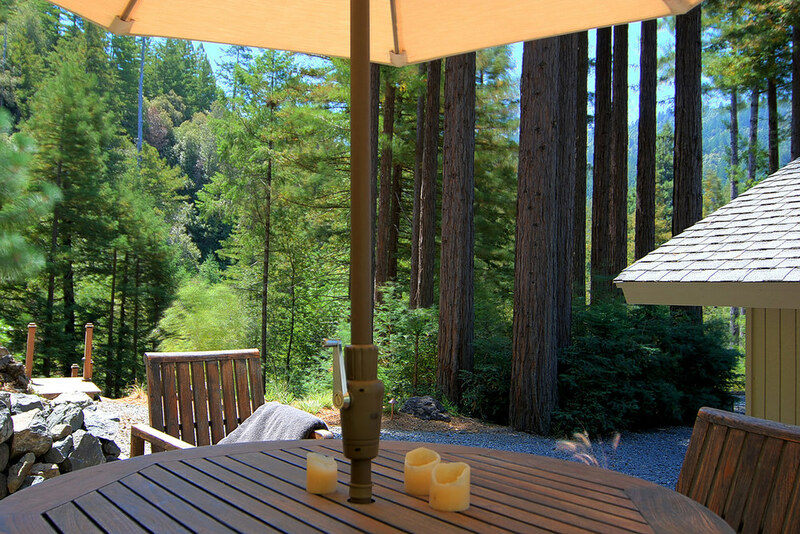 The massive outdoor dining table was custom made from the center cut of a local redwood tree and seats fourteen plus people. 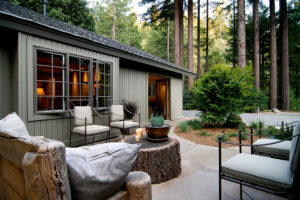 It’s the perfect setting for a family gathering or a romantic retreat. 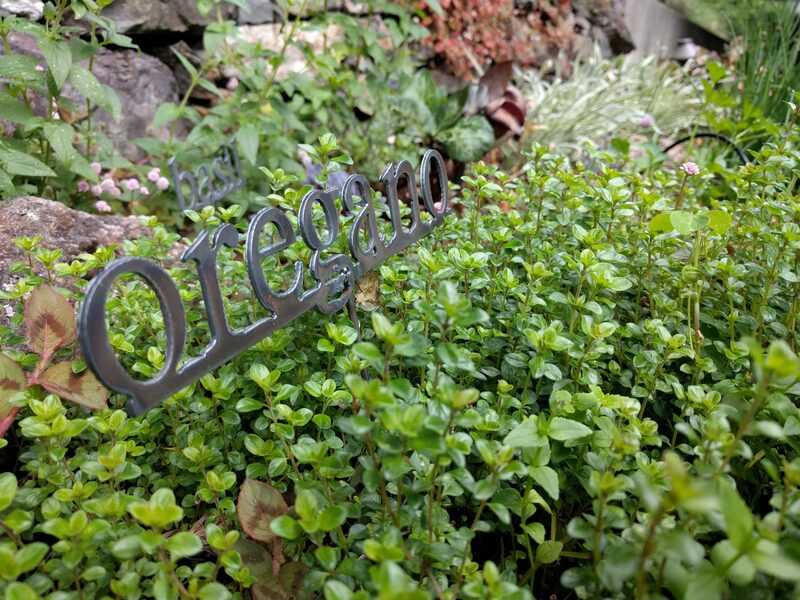 Be sure to also sample from our seasonal herb garden, featuring basil, rosemary, and oregano to name a few. 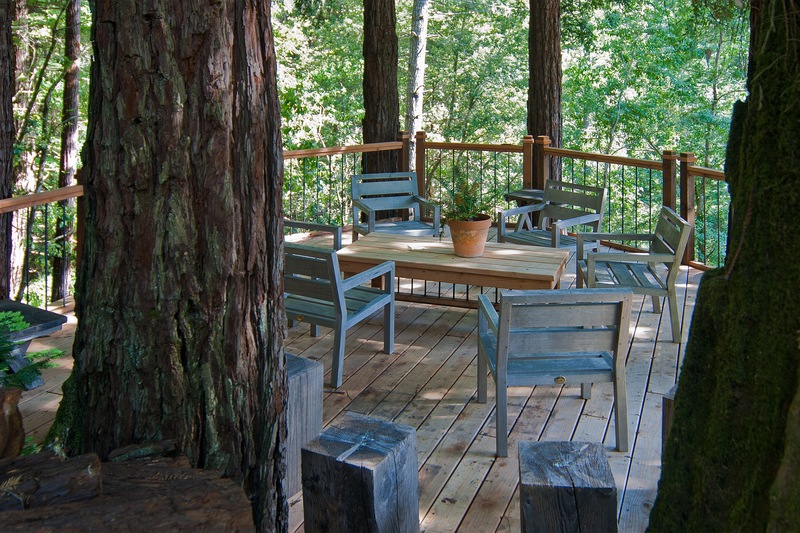 The guest house has its own terrace and seating area. 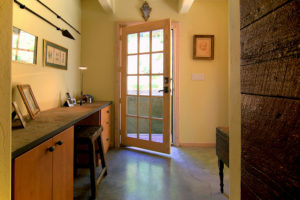 Its windows have beautiful garden views too, but with different vistas, giving this two-bedroom space a unique atmosphere and privacy. 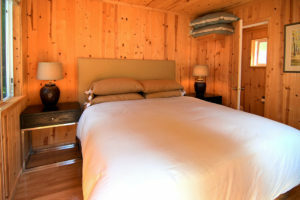 It has king and queen sleeping accommodations. 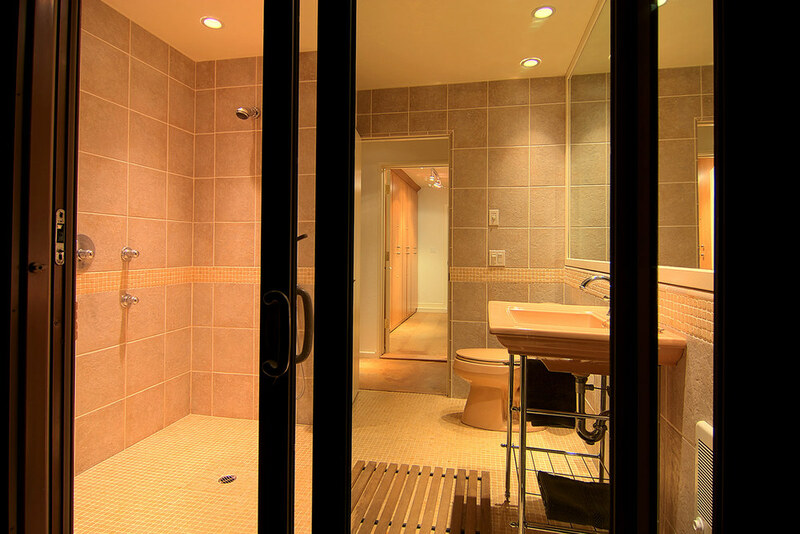 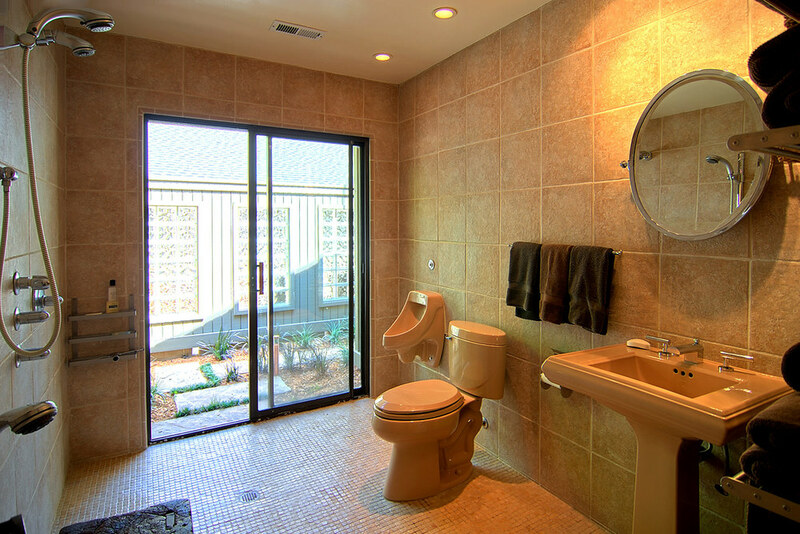 A spacious multi shower head bathroom offers a spa-like experience off a secluded and private patio. The “cabin” is everyone’s favorite. 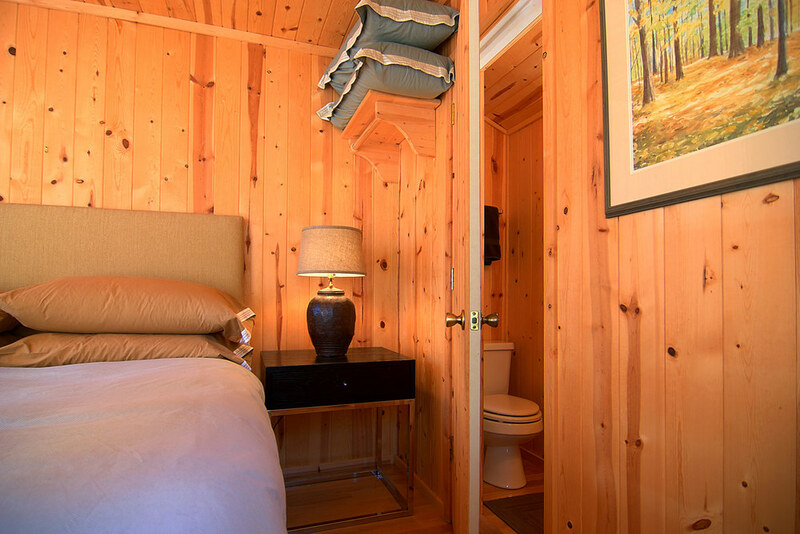 The pine-paneled interior is a classic recreation of the traditional summer camp cottage. 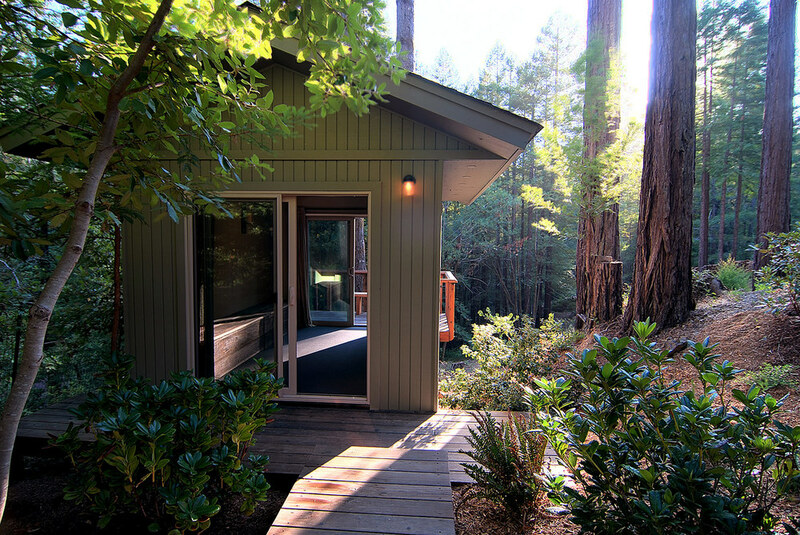 It has an inside bathroom and a redwood-lined outdoor shower. 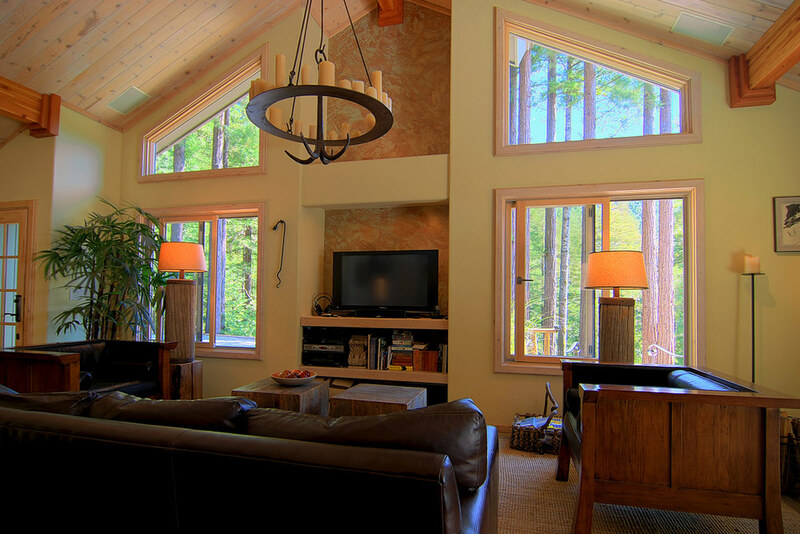 The cabin opens onto another large entertainment area. 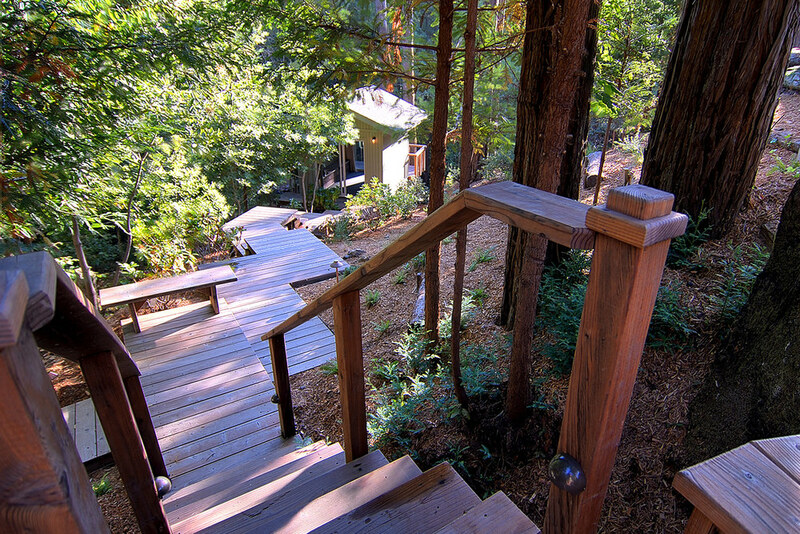 This deck is bordered by more indigenous landscaping, linking the cabin to the hot tub as well as the Guest House. 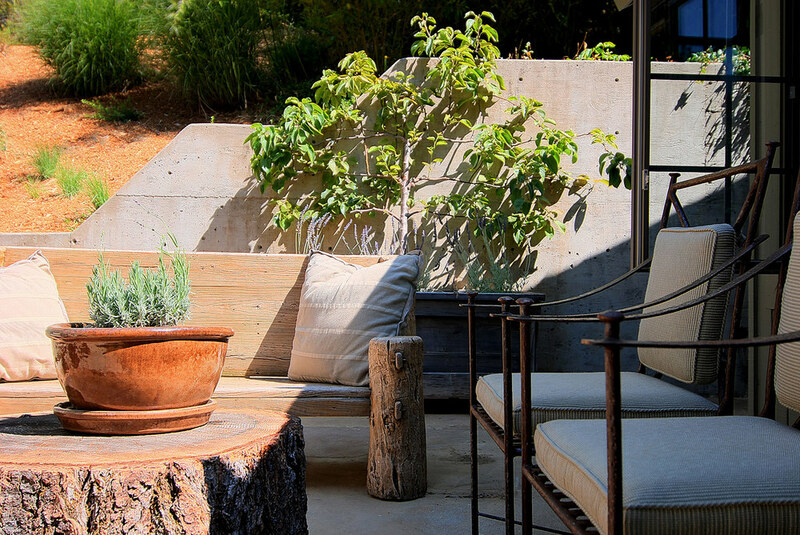 The studio is the final structure, located down a Japanese wood walkway, and offering meditative views. The studio can be used for exercise and yoga, as a massage room, or just another great spot to relax. 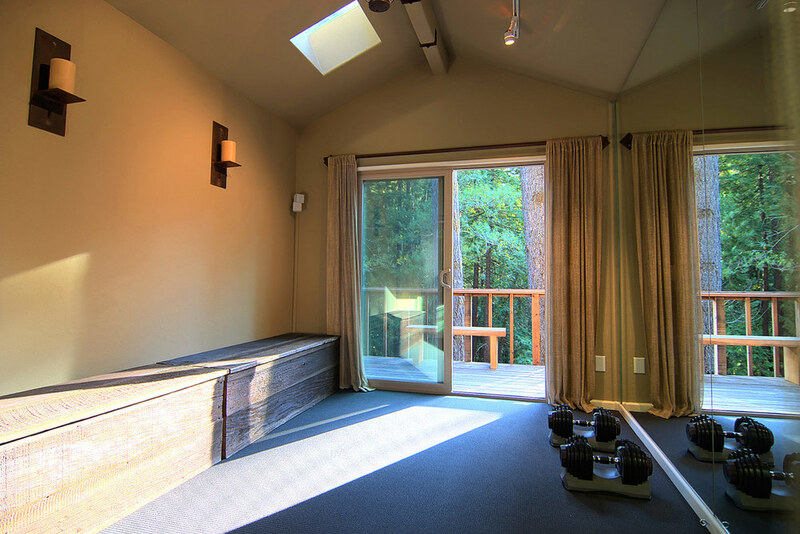 The studio has adjustable weights, a mirrored wall, and other exercise equipment. In the center of the compound is the spa area. 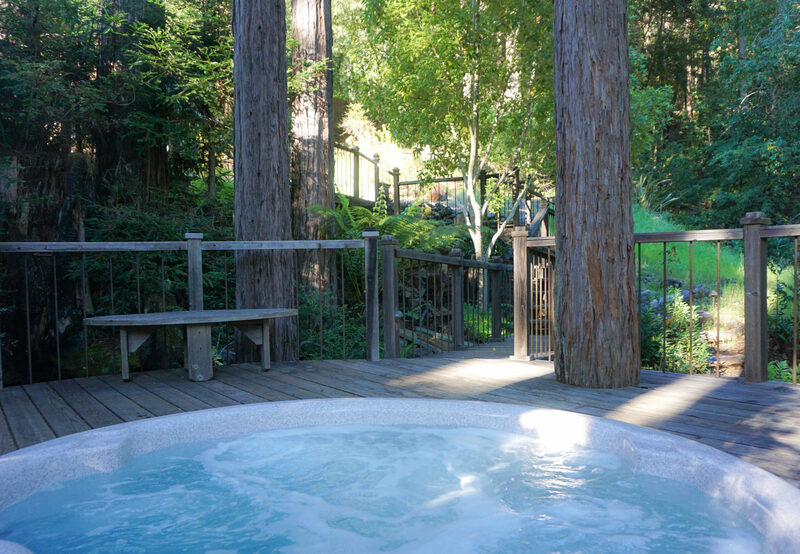 Its focus is a jetted hot tub situated in the center of an ancient ring of redwoods. 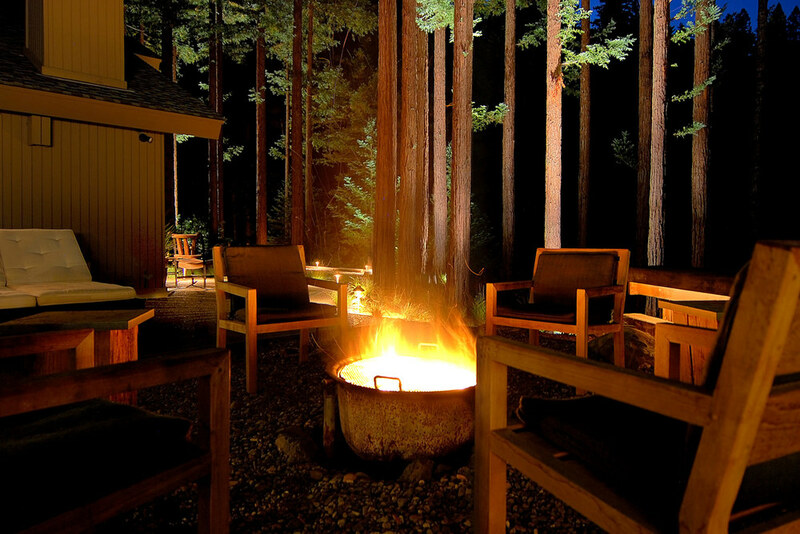 It’s truly a magical location. 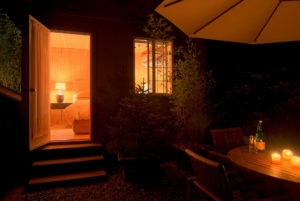 A soak in the hot tub at night lets you link with nature and the starlit sky, a wonderful harmonious experience. 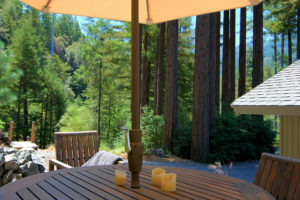 Situated in another ring of redwoods at the top of the compound, the upper terrace is a wonderful place to relax and take in the natural beauty of this unique area. 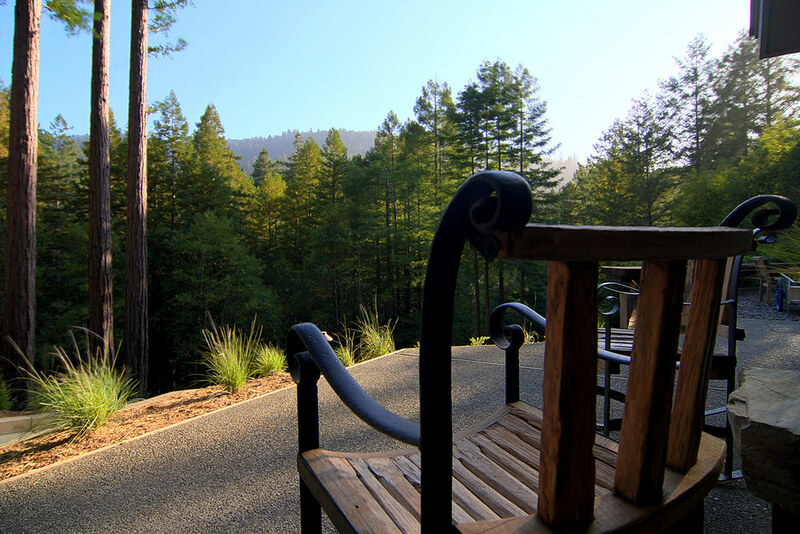 Vistas abound from this higher vantage, and the healing energy of the redwoods can be enjoyed. On a rainy day, the sounds and sights of the waterfall cannot be beat. The fact that Elements is regularly booked by returning guests is a testament to the special place this is. 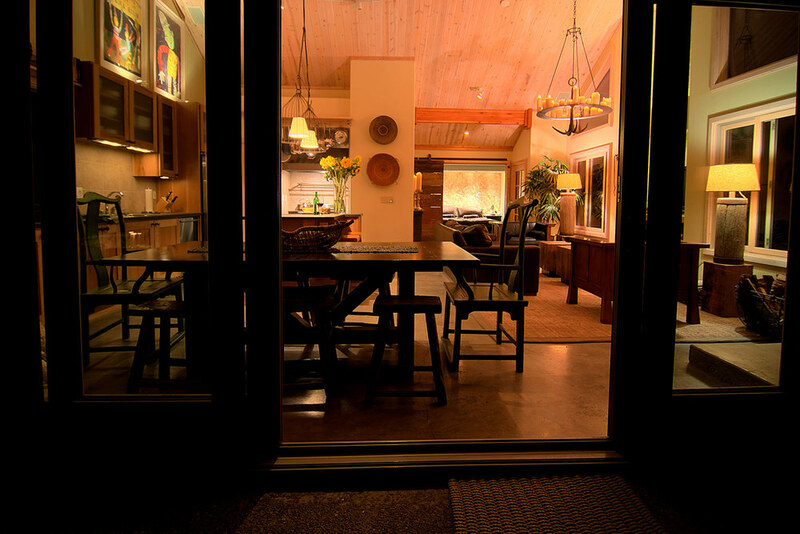 New and returning guests alike often comment how pleasantly surprised they are by the property and amenities. 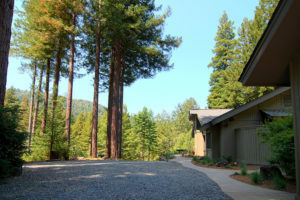 Cazadero is a small historic town located along Austin Creek in the Russian River area. 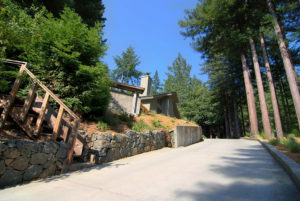 In the 1800’s, it was a luxury hunting lodge for travelers from San Francisco, with daily train service. 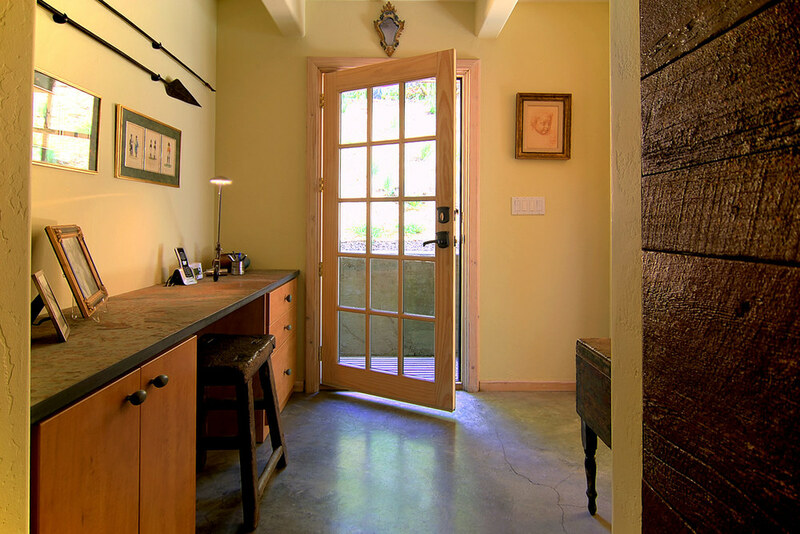 Today the town is comprised of a fantastic old-time General Store, Hardware Store, Jeep Repair Shop, and a post office. 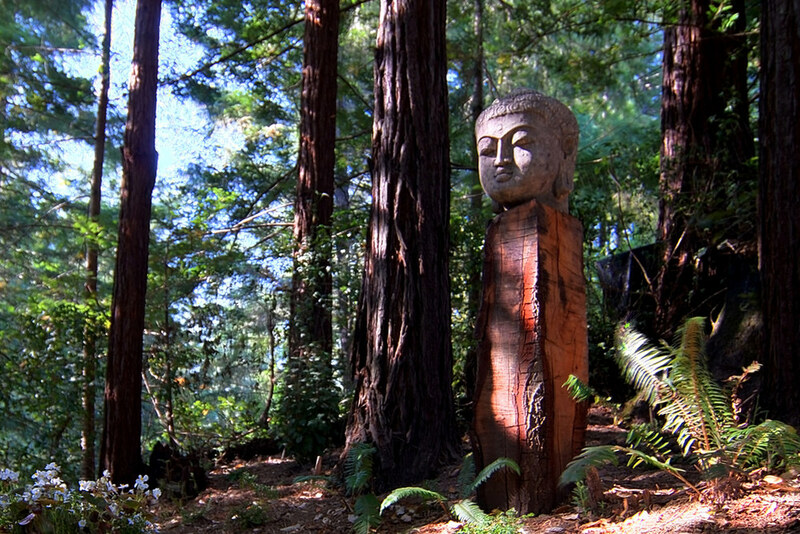 You’re a short drive from Guerneville, the largest town in the area. 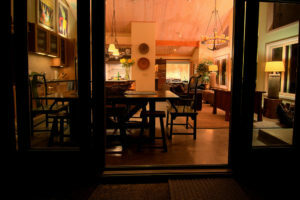 Here is where you’ll find Safeway and numerous foodie restaurants, shopping, and bars. 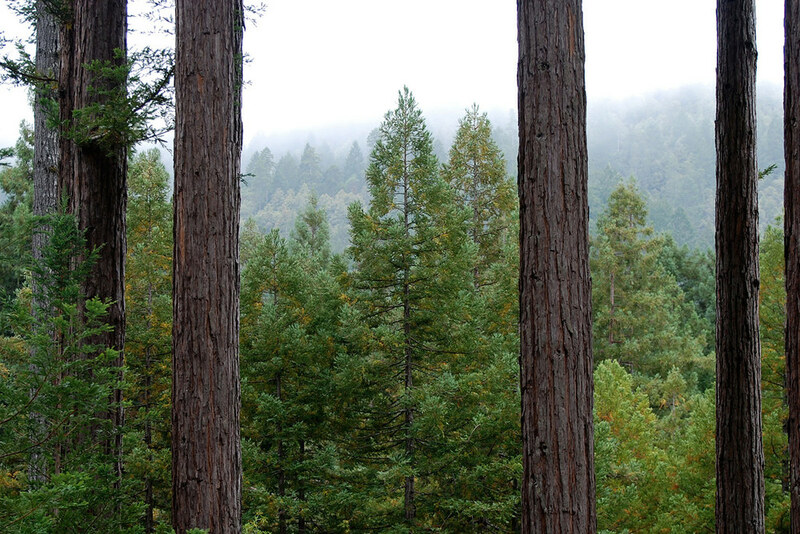 Monte Rio, Jenner, Duncan’s Mills, and Sebastopol are also within a short drive away and offer fun activities. Many guests spend a day floating down the nearby Russian River in summer, wine tasting at the many boutique wineries in the beautiful Russian River Valley (known for its Pinot and Chardonnay), hiking among the redwood giants in the inspiring Armstrong Grove, spending a day at the beach, or simply relaxing on the expansive grounds. We accept reservations exclusively through AirBnB. 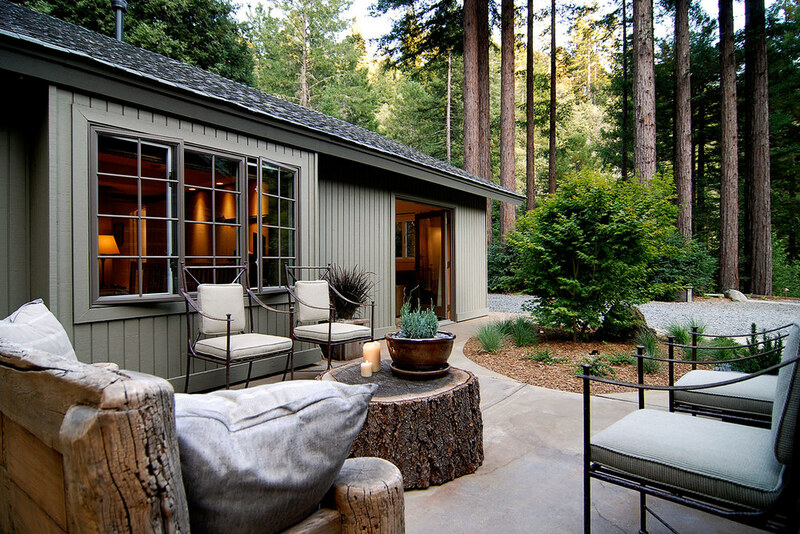 The Elements at Austin Creek is a sophisticated, private vacation rental nestled in the majestic redwoods of Sonoma County, California.